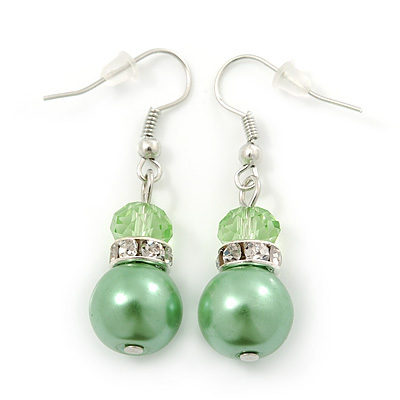 Update your look with these classic Lime Green Simulated Glass Pearl, Crystal Drop Earrings In Rhodium Plating. Featuring a simple drop design, made of 2 graduated lime green glass beads. The large bead is about 12mm in Diameter. The beads separated with a single crystal ring, for a dash of sparkle. The earrings measure about 40mm in Length and secure with a silver tone shepherd's hook fastener. These smart earrings will lift your style in one simple step. Each earring weight is about 3.5g.